Last Friday evening members of Silicon Soul attended Project Demos II, part of the New York Electronic Art Festival. Excellent presentations were made by Cindy Poremba from of Kokoromi Game Art Collective and by collaborators Stephanie Rothenberg and Megan Michalak, who presented a work-in-progress World X Diagnostics. Choreographer and arts researcher Norah Zuniga Shaw, presented Synchronous Objects, created in collaboration with Maria Palazzi (Advanced Computing Center for the Arts and Design), William Forsythe (choreographer), the Forsythe Company, and dancers, computer scientists, architects, neuroscientists, designers and geographers from Ohio State University. The composer/neuroscientist and the dancer/digital animator in Silicon Soul had eagerly anticipated the presentation. Briefly, the project uses algorithmic approaches and animation techniques to analyze the choreography of Forsythe's dance One Flat Thing, repeated. Choreographic elements such as gestures, gaze, and cues can be isolated from the dance and re-presented through a dizzying number of visualization tools. By the end of the thirty minute presentation this dancer/digital animator was silently screaming, "Just show me the dance!" We must admit, however, that the next day we had enormous fun playing with the web-based Synchronous Objects, using the such tools as CueVisualizer and the MovementMaterialIndex. Try it. 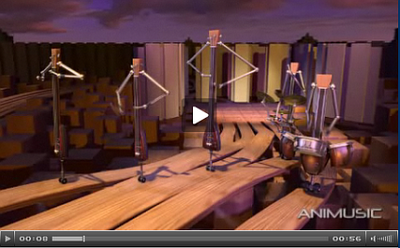 The following video presentation of the project was produced by WOSU. 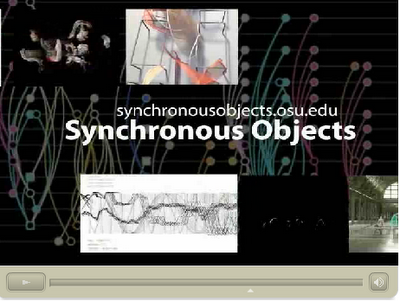 Clicking the image below will take you to a promo video on the Synchronous Objects site. Dialtones (A Telesymphony) was originally presented at Ars Electronica eight years ago. It was conceived by Golan Levin with contributors Scott Gibbons, Gregory Shakar, Yasmin Sohrawardy, Joris Lehner, Gunther Schmidl, Erich Semlak, Jonathan Feinberg and Shelly Wynecoop. From the artists' statement in 2001, "In the hype, hate and hypnosis surrounding the mobile phone, its potential as an ingredient of art has been largely overlooked [emphasis added]." As an electronic media artist, Levin has created and/or collaborated on a wide range of projects. He is also an educator and the organizer of Mobile Art && Code, a symposium to be held at Carnegie Mellon University from November 6th through 8th. The event and online community are "dedicated to the democratization of computer programming for artists, young people, and the rest of us." ...or just the clever prop of a performance artist? Either way, if you're in NYC, you can catch My Robot Friend at 92YTribeca, tonight at 9.